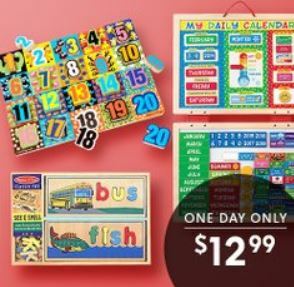 Today only, you can cash in on several Melissa & Doug Skill-Building Toys for just $12.99 (Retail $19.99+)! Plus, these items all ship for FREE! HURRY over HERE to shop the sale. Note: If you don't have a Zulily account, you can head over here and quickly create one so you can shop the sale.